Your Executive Team is a demanding bunch. Short on patience and long on experience, they expect sharp insights delivered in a concise manner. When it’s time to deliver your customer service presentation, make sure your deck and message are on point. 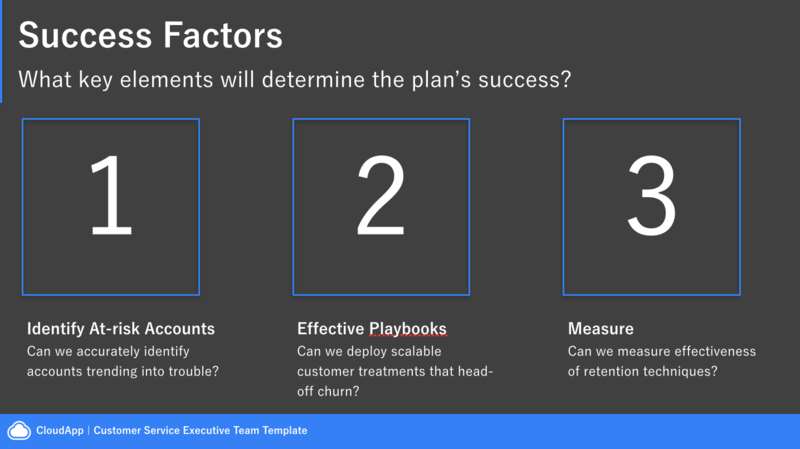 We built this Customer Service Executive Team’s Template to help you adopt best practices that give your message the best opportunity to shine through. You’ll notice it’s nice and short (5 slides) which is your hint to keep it brief. And the design is fairly sparse but with a few eye-catching elements. Your Executive Team doesn’t want flair…but they don’t want to be lulled to sleep either. 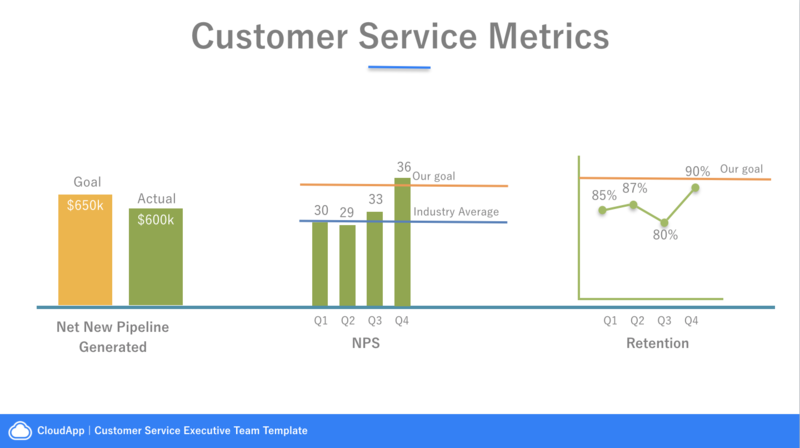 In your first slide hit the Executive Team with a summary of the state of your customer service business. Don’t be tempted to stretch it over several slides. Just get to it. Short and sweet. If any of your “misses” are significant, you may want a slide to detail how you will address it going forward. What are the 3 metrics that really define your customer service strategy? Make sure these metrics have been agreed upon in previous Executive meetings. Stick to these same metrics and don’t deviate unless you have a compelling reason (and explanation). This will build trust with your Executive Team. You’ll notice the charts are hand drawn. You don’t need to paste an excel or Salesforce chart. You’re not presenting data, you’re presenting metrics and trends. Believe me, it’s faster (and better looking) this way. With routine business settled, it’s time to focus on your big initiative. 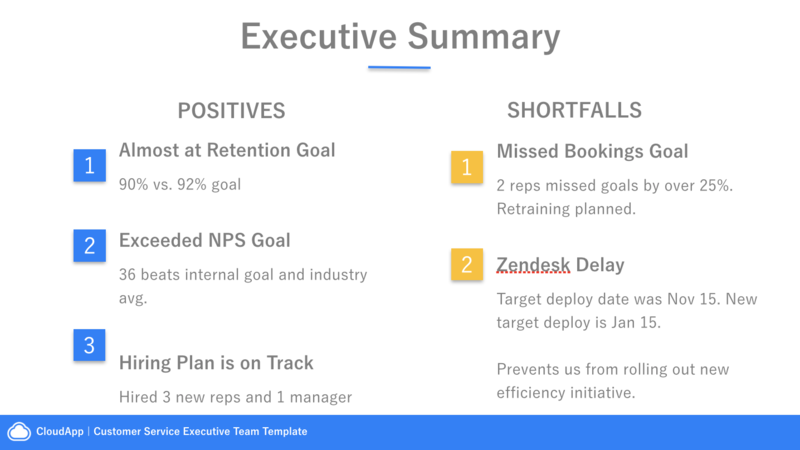 Again, if there is a big issue from your business summary slide, that will likely be what you spend your time on for the rest of the presentation. In our example, you’re rolling out a new customer service initiative. 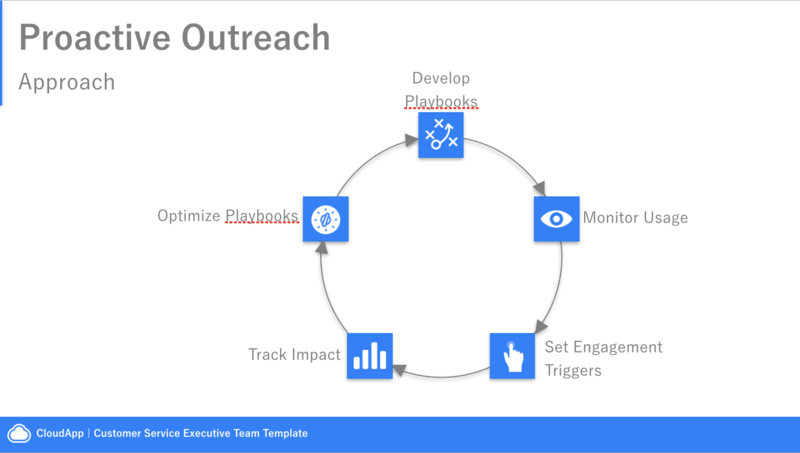 This is where you present your overall goal (make sure it hits the top or bottom line), your strategy and a high-level look at the tactics that will get you there. Your Executive Team will (hopefully) surprise you with insights that will strengthen your strategy. Otherwise, what’s the point of presenting to them, right? You’re asking them for help. To poke holes in your strategy. 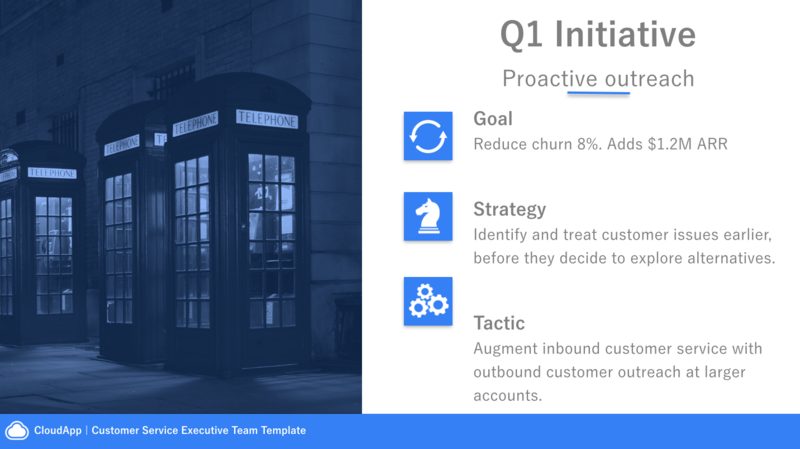 Lay out the key elements of your new initiative on this slide. Keep it clean. Your audience should be able to read your slide in less than 10 seconds and then their eyes and ears should be trained on you. Let your Executive Team know you’ve considered all the things that can go wrong and you’ve whittled it down to 3 essential landmines. The thinking is, if you know the potential dangers, you can guide your team around them.